I love how Charlies Helmet conforms to the shape of his hair! Maybe Charlie only went with the helmet to protect his hair. Sleds, sweet! 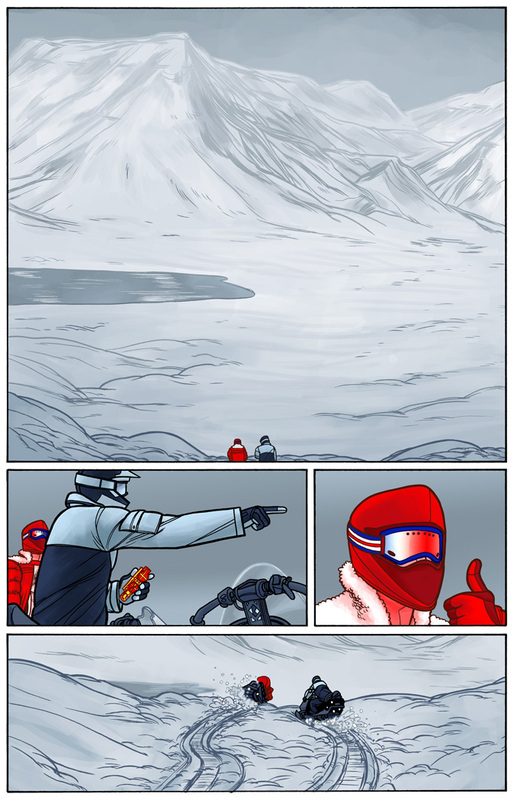 I love how you got the detail right; most people don’t realize snowmobiles have a thumb accelerator. Pure luck, my friend. I have yet had the pleasure to pilot one. This comic is great, wow, I’m amazed of both your artistic talent and your sense of immersion and story-telling. I am totally on edge to learn more about Diver, keep up the good work, you’re the number 1 comic out there for me right now! Thank you very much for all the praise, Emil! We’ll try not to let you down. Nooo! Last page! Beautiful work, can’t wait for more!